What if ….bloggers decided to join together and promote healthy snacks? Have you noticed that there are many bloggers who are avoiding processed food for snacking? These bloggers are already influencing the people who read their blogs and the people that live and work in their life. Many bloggers I read have chosen to go the real food route because of health or allergies. With each of us influencing our little world, the economy and the demand for products is changing. Instead of hitting the aisle in the convenience stores we are checking Pinterest on our smart phone for inspiration and making sure we have some healthy items stashed away in the car, backpack or pantry. It hasn’t made a huge difference yet. However food companies are feeling cumulative effects of changes to snacking. What could we do if we bloggers worked together? Maybe a bunch of bloggers could do a day of the healthy snack? If you like that idea, write a post about it or send a suggestion. If you have a post on healthy snacking, post it below in the comments so I can pin it to my board. In the meantime, here is a the recipe I fixed today that was inspired by the one in the picture. I adapted it and preparing it got me thinking about this post. Preheat oven to 400 degrees. Rinse cooked chickpeas and dry by rolling in a towel. If the skins come off, you can discard them. 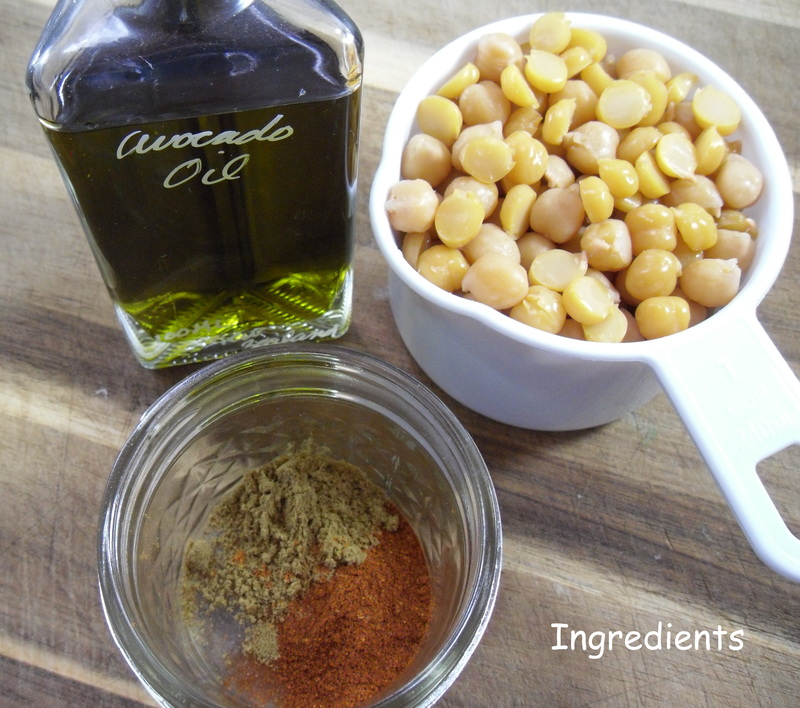 Combine spices and oil and add chickpeas. Toss to coat evenly and place in a single layer on a baking sheet. Bake till crispy for about 25 to 35 minutes. Serve immediately or pack in a dry storage container for later. There are some recipes that suggest cinnamon. I will try those next time.